The Sugar Milling Council compiles and distributes information and fact sheets on many matters of interest to its members and the general public. Australia’s sugar mills are self-sufficient in energy. By burning the fibrous cane by-product, bagasse, mills generate electricity and steam to power all factory operations. Bioethanol (ethyl alcohol) can be derived from sugarcane or its by-product, molasses. In Australia, one of our sugar milling members produces pure and methylated ethanol to meet the demands of a wide range of applications: the printing industry, cosmetics, toiletries, aerosols, industrial chemicals, household cleaners, pharmaceutical, medical and biological products, food and beverages, flavours and fragrances and surface coatings. 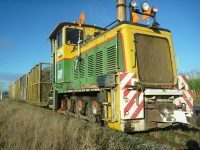 Railway networks that haul sugarcane to mills for crushing are a local feature along the Queensland coast. The mill-specific networks (610 mm gauge) and rolling stock are owned, operated, upgraded and maintained by sugar mill owners.